Hot, sultry, filled with the sounds of music and bright with color and tradition, Cartagena de Indias in Colombia has been an important port on the Caribbean since it was founded in 1533. Gold and silver left the port bound for Europe, pirates looted the city, and a walled fort grew to protect both shipping and the slave trade. Cartagena still draws interest, but from tourists who come to enjoy the history, the sights, the weather, and nightlife. Plan to stay several days, to enjoy the colonial period, the modern city and the fashionable seaside resort of Colombia's second port. 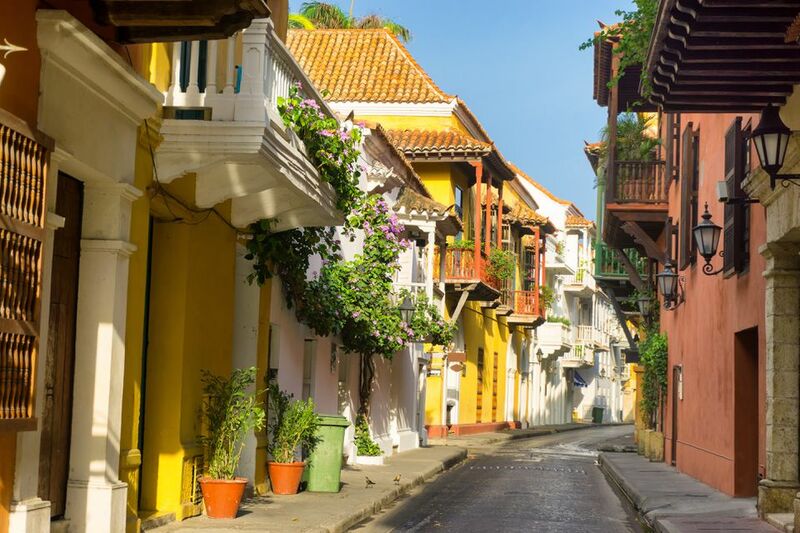 Cartagena's colonial charm and the old walled city, the Ciudad Amarullada, with tiled roofs, balconies, and flower-filled courtyards, beckons visitors to stroll the narrow streets or to enjoy a weekend getaway. Casa de Marqués Valdehoyos, on Calle Factoría, is a good place to begin your explorations of the old city. This house exemplifies old Cartagena, and the tourist office inside offers maps and information. Museo de Oro y Arqueloguía on the Plaza Bolivar has a good collection of gold and pottery of the Sinú culture. Also on the plaza, the Palacio de la Inquisicíon is a fine example of colonial architecture. Behind the charming facade, a museum displays instruments of torture from the Spanish Inquisition, pre-Columbian, colonial and independence-era art. Cartagena's Cathedral, with its massive exterior, simple interior, and fortress appearance was begun in 1575, partially demolished by Sir Francis Drake's cannons, and completed in 1602. Iglesia de Santo Domingo on Calle Santo Domingo, which is little changed from colonial days, is the oldest church in the city, and like the cathedral, was built to resist invaders. Las Bóvedas are dungeons initially built for military purposes and now house boutiques and tourist shops. Castillo de San Felipe de Barajas is the largest of a series of fortresses built to protect the city from pirates. A must-see is the tunnel system meant to facilitate supply and evacuation of the fortress. Overlooking the fortress, the Convento de la Popa boasts flowered patios and a great view of the city, particularly at sunset. The convent once served as an additional fortress and now houses a museum and the chapel of the Virgen de la Candelaria, Cartagena's patron saint. Cartagena's newer areas, Bocagrande and El Laguito, on the peninsula facing the Caribbean, have become the fashionable location of upscale hotels, restaurants, and shops. You may be disappointed in the beaches, but dancing until dawn in one of the city's hotspots might make up for it. Mompós, on the Río Magdalena, was once an important trading river port between the Caribbean and the interior of the country. As the river current shifted, the city was stranded and commercial life ended. Remaining, however, are the curved streets paralleling the waterfront, deliberately designed that way to foil cannonballs and the graceful colonial architecture. Santa Marta is a deepwater port, the oldest Hispanic town in Colombia. Its colonial tradition is all but gone, but the attraction of the city is the gateway to the Sierra Nevada and the pre-Columbian ruins of La Ciudad Perdida. Be aware that Santa Marta is the shipping point for contraband and drugs. The Museo Arqueológico Tayrona displays a collection of Tayrona gold and pottery and a good model of the Lost City. The nearby Quinta de San Pedro Alejandrino is the estancia where Simon Bolívar died. There is a monument to the Liberator on the grounds. Be sure to see the pictorial history of the Liberator's life. Parque Nacional Tayrona is a scenic mix of white sand beaches (rough currents make swimming dangerous,) coral reefs, jungle slopes, and the steep peaks of the world's highest coastal range. Popular with trekkers, hikers, and campers, the park also has an ancient Tayrona village, called Pueblito, under excavation. If your visit falls in November, you might enjoy the celebration of Cartagena's independence. On November 11, 1811, the Declaración de Independencia Absoluta was signed, declaring independence from Spain. This article was updated by Ayngelina Brogan.